Daphna Golan-Agnon has gained international recognition as one of the most courageous and eloquent voices for a more just Israeli society. In this moving memoir, she writes of her early years in a right-wing Israeli household as the daughter of a former member of the Stern Gang, her marriage into the family of the country’s most eminent novelist, and her efforts to raise children in a society caught up in violence and instability while working simultaneously for political change. Through anecdotes, interviews and letters, Next Year in Jerusalem provides an insider’s view of the milestones of the Israeli peace movement, drawing on Golan-Agnon’s experience as co-founder of the pioneering human rights organization B’Tselem and the feminist peace group Bat Shalom. From protests against the Ansar III desert prison, where Palestinian political prisoners languish for months in harsh conditions without trial, to the landmark 1999 Israeli High Court victory to abolish torture, to the devastating tensions that arise even among like-minded Palestinian and Israeli activists, Golan-Agnon candidly portrays the growing movement of Israelis who understand that the occupation, beyond persecuting Palestinians, is destroying Israel from within. Confronting the Palestinian-Israeli dilemma in all its complexity, she remains stubbornly optimistic, never entirely losing hope of a brighter future. 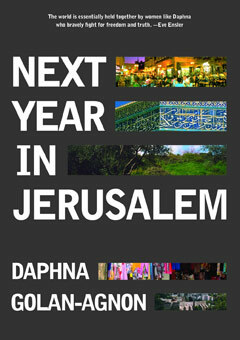 Next Year in Jerusalem gives readers a unique, personal view of the joint struggle for peace.